(CNN) -- Speculation in South Korean media that Kim Jong-Il may have cancer is the latest development in a busy month for North Korea watchers. 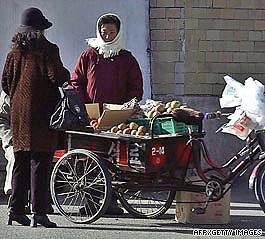 A 2003 file photo of fruit vendor in Pyongyang. The U.S. Navy tailed a North Korean ship that was believed to have been carrying weapons bound for Myanmar. Diplomats bemoaned the state's reluctance to return to the negotiating table even as the regime in Pyongyang celebrated American Independence Day by lobbing seven short-range missiles into the Sea of Japan. But a worldwide network of amateur sleuths has been watching a different trend emerge in the Stalinist state: Capitalism. This grassroots group of North Korean observers has watched the growth of village markets via satellite photos courtesy of Google Earth. They compare notes and analyze photography on the Web site "North Korean Economy Watch" (www.nkeconwatch.com). "There's a whole bunch of small-scale private enterprises that have sprung up," said Curtis Melvin, founder of the site and an economist at George Mason University where he's working toward his doctorate degree. "With Google Earth, you can scroll back through time from the most recent satellite photographs and see how these markets are growing. "In large towns you can see multiple markets, but you can find them in every town and every city," Melvin said. The growth of these markets -- long on the fringe of legality in North Korea -- has caused government leaders to begin clamping down on the practice as a threat to the regime. According to North Korea watchers, border police began clamping down on widespread smuggling last year. In December, Pyongyang stopped South Korean tours to the border city of Kaesong and reduced number of South Koreans allowed to work in the Kaesong Industry Park. The relative stabilization of the North Korean economy "formed a background for a backlash against the market-oriented institutions and activities that were grudgingly tolerated for a period of time," wrote Andrei Lankov, a professor of North Korean history at Kookmin University in Seoul, in a study released this week. Lankov, a native of Russia, spent a year in North Korea in the 1980s and has studied and written about the groundswell of capitalism in the country. The markets began sprouting in the wake of the famines of the 1990s as North Koreans struggled for additional food and income. The public distribution system of food and supplies collapsed as aid from the Soviet Union dried up and "grassroots capitalism was born," Lankov said in an interview. Although he returns every year to North Korea on highly restricted visits, Lankov gathers most of his information on the country's markets by making frequent trips to the Chinese border and interviewing "the people who have a fairly good idea what's going on - smugglers and Christian missionaries," he said. The North Korean government appears confused how to handle capitalism within its borders. The government nominally embraced the legality of markets in 2002, but in recent years has been clamping down again. For example, mobile phones were legalized for sale in 2002, but by 2004 they were banned again. Late last year, the central government notified local officials that all private markets could operate only three days a month in 2009 - yet the new restriction was never adopted, Lankov said. Some economists estimate North Koreans earn more than 50 percent of their income by illegal trade. It's even the subject of dark humor within the country, said Lankov, quoting a self-deprecating joke North Koreans make: "There are only two kinds of people in North Korea: those who are engaged in trade and those who are dying." There is a belief that regional governors are making so much money from operations in their districts they are allowing them to grow unchallenged, Melvin said. "It's not clear where all this is going," he added. In addition to the growth of markets, Curtis and his fellow North Korean watchers have congregated information under the link titled "North Korea Uncovered," which labels buildings, objects and monuments throughout the country, including Kim Jong-Il's palaces (one of which has a waterslide), suspected mass graves, prison camps and nuclear facilities. Melvin began the project in 2007 after visiting North Korea in 2004 and 2005, traveling with a group of North Korean supporters from Europe. "We were subjected to North Korean propaganda which was pretty exhausting ... everywhere you go you hear about the Great Leader doing this or that; advice he gave to the makers of a dam, or advice he gave to farmers," he said. "It got a little scary toward the end (of his first trip) ... someone's room got ransacked, someone's computer was broken into." He returned in 2005 to watch the massive May Day "Arirang" public demonstration in Pyongyang celebrating the 60th anniversary of the end of World War II. "Kim Jung Il showed up, there were 150,000 people in the stands and 100,000 people performing on the field. it was an absolutely surreal event I will never forget." As an economist, Melvin was fascinated to see the last vestiges of Stalinist Communism. "It was like stepping into a time machine, everything was like out of the 1950s, including the music you heard and the hair styles of the stewardesses on the plane," he said. "I'd always been fascinated by totalitarianism, so it was kind of like viewing a train wreck in action." His tours were severely restricted to only areas the government wanted him to observe, but with Google Earth "we can stick our face over the fence and see what's going on," Melvin said. "The great thing about the Internet today is we can bring together people who have their own experiences with North Korea, who were scattered across the planet," he said. "We can check people's information against other people's information and against maps." A recent revelation - Melvin had noticed small objects in rivers around the country, but couldn't make out what they were. A Web site viewer knew: "They were whole fleets of dredging machines. The guy who wrote in said he spent his whole life working on dredging machines," he said. Detailing dredging machines may not seem revelatory, but North Korea's tight restriction on travel and information makes every morsel fascinating for Melvin and other amateur North Korean watchers. "If North Korean government was more open, this stuff wouldn't be interesting to anyone at all," he said.